We’d love your help. Let us know what’s wrong with this preview of Reposition Yourself by T.D. Jakes. 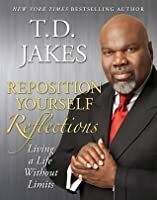 Reposition Yourself, the narrative book, uses wisdom collected from more than thirty years of Jakes's experience counseling and working withhigh-profile and everyday people on financial, relational, and spiritual creativity on the path to an enriched life filled with contentment at every stage. To ask other readers questions about Reposition Yourself, please sign up. how do I read the book online? James Calhoun how do i read the book online? I would really give this book a 3.5 stars. A good book overall, but I read so many books about self improvement that the overlap seems to phase me. He says a lot of the same messages. The first 60 pages are pretty fast, then it slows down. The last 80 pages are more focused on how women can succeed, so I skimmed through those pages. Its a great book for people that are very religious that don't read too much besides religious books. He uses a lot of scripture to begin talking about everyday life I would really give this book a 3.5 stars. Its a great book for people that are very religious that don't read too much besides religious books. He uses a lot of scripture to begin talking about everyday life. Because of that, I think that the book makes a great segway for people that can start with religion or faith and then move to all the other areas of their life. One important point that Minister Jakes said really stuck. In the book, he spoke about a situation where some parents were setting up a trust fund for their kids. Their kids were going to get EVERYTHING. House, cars, money, etc... but then during the conversation with the minister, a reminder was made to the parents that 'struggle' is what made the parents great and even though the kids were going to be taken care of financially, the struggle is really what made the parents great. Its really starting to hit me how many of these books that I have been reading and the seminars that I have been attending have been focused on: continual learning and progression. In a way, I can't really elaborate on. Something about making a committment to lifelong learning and growing will bring daily fulfillment. I somehow connect that with Tony Robbin's saying "Its not about the goal, its about growing to become the person that can achieve that goal" My mind makes a connection between the two, but some parts I am still trying to figure out. This is book 12 for me in 2008. It isn't even the end of March and I am halfway done with my book record on the year. I am a monster! AHHHHHHHHHHHHHHH! In this book, T.D. Jakes shares the tools to help you succeed and be prosperous. It reveals truths, practical solutions and insights that enable you to progress to your full potential and to achieve the life you have always dreamed about. Like with any knowledge received, the reader must apply what he or she has learned into their own life. There are things I learned from reading this book, and I would recommend this book to anyone who truly desires and are motivated to live life without limits. This book came into my life when my dad was diagnosed with stage 4 colon cancer. This was the first time I had ever read a book by this man, and I highly recommend any book that is written by him because he tells it like it is, and he has the ability to make you see life in a brand new way. T.D. Jakes is the real deal. This book changed my life! It really made me evaluate where I was and where I was going for the rest of my life. Powerful! Excellent book to keep close by as a reminder that if you want different results about yourself, don't do the same old thing in the same old way! Expect change when you yourself institute change, starting with yourself! Thank you, TD Jakes! This book is like a new and improved version of Paul Tillich's The Courage to Be. This book made me love Bishop Jakes. I read this book at a point of change in my life and it spoke to me. The "characters" that the bishop put in the book made me rethink a lot of what I was doing in my life. This is a must read for those that need to look inside for change. I enjoyed this work very much and with all books that I read, this is one that I will revisit often. Great work by papa Jakes. This book taught me about repositioning myself. I read this book before I started the process of writing my own book. It is a really good read. Another awesome experience. Made me think about my past, present and how I can get to my desired future. Great book! It caused me to re-evaluate my life and make some necessary changes! Awesome awesome awesome. Great book to give you perspective on goal-setting and living your life. One of the best books about turning things around when they seem to be hopeless. If you are searching for a life with no limits or boundaries and you seek increase all around you. Then I recommend this book for those who are ready to transisition themselves as a whole. Bishop T.D. Jakes touches on things that we try to avoid when we are seeking change in our lives. He doesn't preach to you, he speaks to you one on one as he shares stories and guides you through stages. If you are not ready to reposition yourself and receive all things possible after reading this book, then y If you are searching for a life with no limits or boundaries and you seek increase all around you. Then I recommend this book for those who are ready to transisition themselves as a whole. Bishop T.D. Jakes touches on things that we try to avoid when we are seeking change in our lives. He doesn't preach to you, he speaks to you one on one as he shares stories and guides you through stages. This is a shrill wake-up call to take charge of every single moment. Not only does it confront areas where subtle passivity or even poor choices may have stifled the reader's creativity, but it also instructs how to manage change and maximize life now. Using wisdom collected from his more than thirty years of counseling and working with everyday and high-profile people, Jakes covers financial, relational, and spiritual creativity and shows how adapting to transitional moments in your life is the This is a shrill wake-up call to take charge of every single moment. Not only does it confront areas where subtle passivity or even poor choices may have stifled the reader's creativity, but it also instructs how to manage change and maximize life now. Using wisdom collected from his more than thirty years of counseling and working with everyday and high-profile people, Jakes covers financial, relational, and spiritual creativity and shows how adapting to transitional moments in your life is the path to an enriched existence filled with contentment at every stage. I LOVE THIS BOOK. IT WAS GOD WILLING FOR ME TO BUY THIS BOOK LAST 2 YEARS AND READ IT NOW BECAUSE GOD PUT ME IN THE RIGHT PLACE,AT THE RIGHT TIME WITH TH ERIGHT PEOPLE TO HELP ME WITH MY DESTINY! 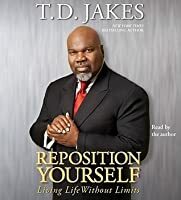 BISHOP TD JAKES KNOWS HOW TO GET INTO US WITH ALL THOSE ENGLISH WORDS I DIDN'T HAVE TO FIND THE MEANING OF IT IN THE DICTIONARY ALTHOUGH ENGLISH IS MY SECOND LANGUAGE. WHEN YOU READ IT IT CLEARLY EXPLAINS EVERYTHING TO YOU. A great book for anyone dealing with a rough patch in their life. The author is clear without being simple and motivates without being preachy. We can and must aspire to better ourselves and our relationships. Although his message, I believe, should have universal appeal, be forewarned that it is through and through, a very Christian book. If this is a deal breaker, you will miss out on a great resource for your life. He really goes in depth with significant attributes of areas to focus on like branding yourself, embracing change, and growth. All of these areas can cause fear, stress and reluctance to go forward. T.D. Jakes acknowledges these areas and stimulates the reader to move forward in spite of our emotions. I enjoyed this book. It was on the book shelf as I was approaching another benchmark in my life. Great encouragement was found as was the right answers of questions that had come to mind during my time of repositioning myself. Ladies who are emptynesters, menopausers, go for it. Well worth the read. An inspirational book for all, especially if you are searching for a way out of "the rut of life." I couldn't help think when listening to this book that is was geared towards my black brothers and sisters, but then I figured that is the author's experience. Regardless, the book is quite uplifting. 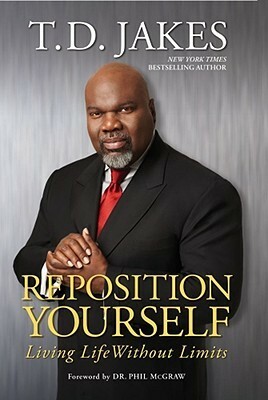 Reposition Yourself Reflections is a list of 100 things to reflect on to better place yourself for success. People want to be better, but often forget to set themselves up for what they want. We need to be ready mentally for the challenges and trials of success, and remember that we need to maintain our foundation to continue growing for ourselves and those around us. Rev. Jakes has a great handle to getting out of your daily rut. A solution to the ordinary life and I love it and recommend it highly. With a forward by Phil McGraw, it made it a "better" reading idea. It's a new form of "how to". I really liked this book. Won't go into detail about how it came to be in my presence. It was something I definitely needed to read right now and has showed me a few ways to deal with some issues I have been having the past few years.